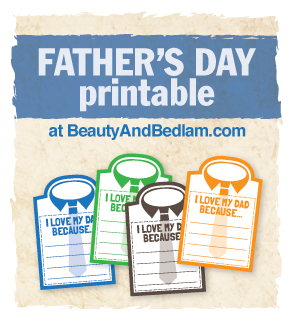 Jen from Balancing Beauty & Bedlam has two fun freebies for Father’s Day gifts! Print out this Father’s Day coupon book with coupons like “free breakfast in bed” or “mowing the lawn”. This is definitely a very fun and meaningful gift. The second freebie are “I Love My Dad Because” printable sheets. These are for your children to write down reasons they love their father and can also make really cute, valuable gifts.